Set on our stunning new onsite bike trails at Castle Ward the challenge entails cycling continually around the trails in the dark! 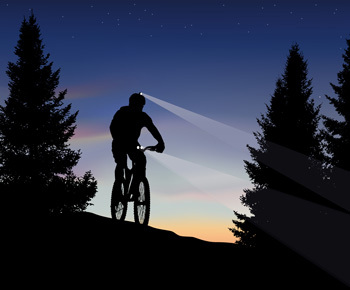 – ‘Dusk til Dawn’ – lights, bikes and all safety cover provided. The challenge can be done by teams of 3+ people whereby 2 people minimum cycle at any one time while other rests. Working in small teams (4 people per team) participants will navigate their way around our 900 acre estate completing a variety of challenges along the way. Cycling, Orienteering, Canoeing, Abseiling and mystery team challenges are just a few activities to expectâ€¦…. This popular option lets folk test their nerve from the dizzy heights of our countries highest points, whether it is our highest city buildings or rock cliffs. Fundraising abseil venues include: Victoria Square (Belfast), Waterfront Hall (Belfast), InvestNI Building (Belfast), Dromore Viaduct, Fair Head, Scrabo Tower (Newtownards) to name just a few. Yes, climb Slieve Donard Northern Irelands highest mountain in the dark under moonlight. It is hard to beat the views across the country of street lights not to mention the stars and moon above you – an experience to be remembered! Torches and all safety cover provided. Slieve Donard daylight challenge also available. 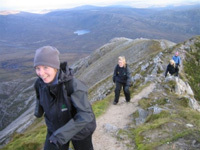 Conquer our highest local peaks in a day – Slieve Donard (Northern Irelands highest mountain), Slemish and Cave Hill. Get your boot on!….